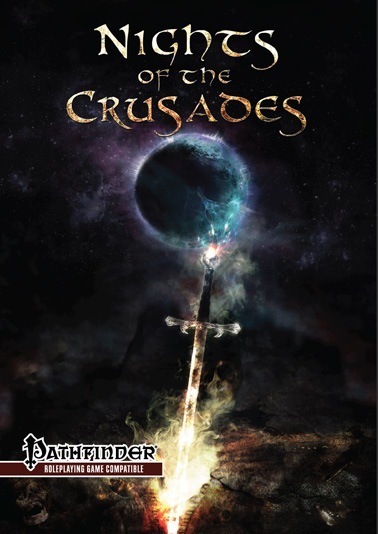 Nights of the Crusades is a roleplaying game set in a land and time that is familiar on the surface, but within its cracks lie tales of alchemy, madness and violence. It is a world that could have happened and then been lost to barbarity and time. Players take on characters that can explore its lands and plunder them for wealth, glory or knowledge. The world is rife with dark cults, creatures that dwell in unseen places and bloodthirsty warriors. This is a time when anyone’s thoughts, from king to slave, are enough to condemn them to death and hell, and many are they that will line up to cheer the execution. As well as 2 monsters and an adventure to launch you into the world of Nights of the Crusades. 1001 thoughts (Well maybe just 7). 1 cover, 1 credits, 2 table of contents, 2 OGL, 1 back cover. 64 – 7 = 57 pages of content. 2 column layout. bookmarked. I’m fairly biased on the Arabian settings. I love them and expect BIG things from these types of books. Legacy of Fire is my favorite AP, and I feel could be adapted to the themes of this book to make it better. 1. The artwork is b&w sketch art, that fits the feel of the theme. Think of it as reading a journal of an Arabic adventurer, traveling the deserts in search of well….adventure. As they say, art makes the book. This book has the right art. With pencil sketches there are sometimes issues capturing the right image. Page 39, guy on the cliff, A. Face of the dijinni….C-. This is a personal taste and should not influence your judgment. Overall I’ll had this out as a 4/5. 2. Introduction section: Gives a basic overly of the book. Can’t really complain here, except for the map of the land pg 9 of pdf…Take it for what it is. A sketch in a journal. I’m a huge map guy and I really wanted more texture. BUT I’m not sure it would fit the feel of the book. But it’s just a few lines with dots for cities, as you would find in say a pathfinder journal. It does a good job of saying “here is your day travel in distance from city to city”. No real scale measuring, so it’s nice to have a “foot path” to follow. It’s an introduction section that is on par but not above. I’ll give it a 3/5. 3. The Mythos section: Intro gives a good story of the 3 different types of perspectives you might find herein. A brief history of the things to set the mood. I really wish there was a little more umpf in the lonely paragraph covering 1001 nights, (once again personal choice, do not let that distract you). This section is 100% fluff and ideas that generate the setting and themes which I think Aetheric Dreams is trying to get across. The idea of giving samples for further reading (like the old White Wolf days) I really appreciate in games. It lets me know as a player, what can help get more ideas across to my players. In my gaming group we have character creation night, where we watch a movie with the theme and ideas and eat “food” that we try to get across to give the feel of the setting. This section I’m just going to give to my players and say read it. 4/5. NOTE: This is a “gritty, low fantasy setting”. Keep that into account when reading the below. 4. Conjuring a character section: Yes please. Two pages of names ranging from English, Byzantine, to Mesopotamian and Persian, both male and female. Cool. Gives questions to help round out your characters. Then gives an idea for “allegiances” or factions to play (Franj, Byzantines, and Saracens) with brief descriptions. Covers brief section of the religions of the era, (brief as in 3 to 4 sentences. Which is since it’s real world and you can search those on the hyperweb for further reading). Then there is Attitude which is a nice change of wording for Alignment. Alignment just wouldn’t make sense in this time. However a Fanatic with quotes “I follow God’s law, not those of men” to the Skeptic “Not revelation, nor authority, nor tradition tells me the truth – but observation and evidence” set great feels for how your character may interrupt the world, better than an alignment would. It’s good, I like it. The character portion of this section has its ups and downs. Lets gander. So there is the caravan merchant. D6, 6+Int skills, med BAB, good Fort/Will. First he gets a “caravan”. Starting with a chest and gaining an elephant. This “caravan” is your pack mule. I like it, this is where you put your “wares”. Wares you say? Yes your wares, which are your merchandise, your wondrous items that basically are your spells for this class. (This is where the flavor text makes me not just say, it’s a caster, but instead sit down and say where is my pen and paper.) So it’s just a spell caster? Mechanically fine, yes. But the FLAVOR of this class for the wares is what I love. Wares: A caravan merchant has a number of items available in her chest, accumulated from her adventures. Merchant wares need to be drawn from the chest and activated, and the wares available can be found in the list below. A caravan merchant must choose and prepare which wares can be easily accessed from her chest before the day begins. Merchant wares are all found items and damaged goods, so cannot be sold. They have also been jostled around the caravan merchant’s chest for so long that they are easily ruined – so once drawn, a piece of merchant ware may be carried by any character until the caravan merchant next packs her chest or until it is activated and destroyed. If this doesn’t explain and make the flavor for the setting, then I can’t explain to you this setting. This gets me and gives me the feel. I think it’s a good flavor and gives a balance (not the right word) fluff wise as to only the caravan merchant can use these items (spells). I dig it. This class also gains improved aid, a guard (lackey), and a couple other social abilities. I don’t care, I fell in love with wares. SO for my love of the caravan merchant, I like this class. It’s a good way to have magic, but not. Next is the Orator, which is a good spell-less bard variant focused on speeches. He gets abilities to manipulate crowds, encourage his allies, and act as a good supporting roles/face for any group. He could be your religious fanatic that is leading a nasty could of elders. Cool. Than we have the Scholar. Very interesting take of your wizard. At first level and ever other level he gets “new mastery level” (chose one of 3 categories to focus on: Lore, medicine, Invention) which gives him some nice bonuses to assist and make the average wizard a little more interesting to play at the expense of a slower capacity. Lower spell capacity? You get up to 9th level spells but at 20th level the number of spells per day across the board is 4. (IE, 4 Zero level, 4 first level, etc.) But the ideas for the Mastery Level at each level are a great balance and addition. I enjoyed the take of this class. Lore: This gives you a focus to become a skill junkie. Which is kind of cool. Medicine: This is a chance to play your arcane based healer. Give it a read. Then you do the rest of character reaction based on PF standard. 5. Weaving a tale section: GM Section: Goes over human sizes, monster types, technology level, magic items (remember low magic, has restrictions), then a little in brief of Combat Trauma and chart. Combat trauma is for characters that suffer from being in combat all the time. I will probably steal this for other games. Kind of neat, adds grit to the game, but not a necessity. Followed by advice on things to help GMs with the setting. Gives neat examples of character motives. Good section on more for running the game, such as weather, managing stories, etc. Ie more GM advice, BUT full of ideas. Then a small article on women. I’m happy they have this and they address women’s role in the era. Worth a read. 3.5/5 Average GM section. +for an article of women of the times and a lot of cool ideas. Overall I’ll give it a 3.5 rounded up 4 for flavor, and price for content. I really like the classes and how they were developed. The fluff and text I thought were enjoyable and sold me (while several sections are brief and I would love more expansion). If you're a fan of Crusade history with a dab of the fantastic tossed in, you should check it out! I got a very nice Prince of Persia/Assassin's Creed/Kingdom of Heaven/Arabian Nights vibe from it. I got a very nice Prince of Persia/Assassin's Creed/Kingdom of Heaven/Arabian Nights vibe from it. Okay, I'll bite. Let's see what they have. Purchased. I think I am the only one that does read this section when I buy products. In the Open content section of page to it says “the game mechanics of this Paizo Publishing game product are Open Game Content”. This product is not a Paizo product. Liz, you may want to email the company to have them update that. On page 2. Reviewed. However my review is not edited. I will come back and do so later. I was sitting on this for a while. I wasn't fully convinced till Liz said give it a go. And I did. I dug it.